These days, when most people do the majority of their shopping in giant supermarkets, out of town shopping complexes or city centre malls, it can be difficult to draw attention to a small business trading locally. But with concerns being raised over community cohesion, social inclusion and the environment, the local business has never been more important. It's down to enterprising business owners like you to promote the importance of supporting local businesses so that the public understand why it matters and how it can benefit whole communities. In order to tackle the trend toward supermarket shopping, it's important to understand why people choose it. Research indicates that the reasons they most frequently cite are the variety of products available and the convenience of having them all in one place. You can challenge this directly through poster campaigns and advertisements which emphasise the variety offered by small independent businesses, contrasted with the way that monopolies tend toward homogenisation. Remind people how convenient it is to have a lot of small shops offering different products and services located in the area, and how convenient it is to be able to shop close to home. It's okay to admit that big business has the edge in some areas if you stress that there's a cost to this. For instance, you could have a poster featuring a pint of milk which acknowledges that it's cheaper in the supermarket but points out how much less time is spent if it can be picked up nearby, so that it still pays to shop locally. If your business purchases its products locally, it's worth emphasising this - shopping with you means supporting local producers and cutting down on the environmental costs of long distance transport. 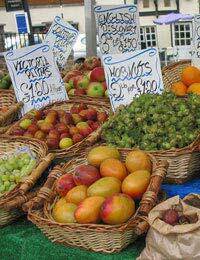 If you sell food, it also means getting fresher produce. You can also point out that local businesses mean local jobs and increased opportunities for local people, encouraging the young to stay in the area and become positively involved with the community. It cuts out the daily commute for many people and makes their working lives more pleasant, something which you can discuss in meetings with trade unions. The Federation of Small Businesses runs regular campaigns on these issues which you can join, thereby getting the support of a strong backer with good media expertise and funding. It can be tough for a small business to make much of an impact on its own, but when you work together with others you can achieve much more. Why not hold a local festival to promote the diversity of businesses in your area? You can present this in itself as a reason for shopping there. If you have a lot of unusual local shops such as craft stores, you may be able to get listed in tourist guides and arts publications. Remember that it doesn't matter whether or not your own business is one of those making the headlines - you'll still do well out of it if people are encouraged to shop in your area. A festival or other local group promotion can celebrate the history and character of the neighbourhood itself and make people feel proud to be a part of it, sending the message that by supporting local businesses they are improving their own circumstances. No matter how frustrated you may be with supermarkets, which don't always play fair, it's important to stay positive in your own campaigning. Customers will respect your business more if it seems to be setting a good example. A significant number of people prefer to do business locally precisely because they see supermarket promoters as unduly ruthless and unscrupulous. Let them know that your business is different and that people should support you not just because they don't like your rivals but because you have lots to offer to the local community. Finally, don't forget to support local businesses yourself! When your business needs a new product or service, look around to see if you can source in within your local area. This can make your life a lot easier, it can help to build business relationships where it really matters, and it gives you the opportunity to lead by example, showing people how it should be done.